You’ve got to hand it to McDonald’s. In a time when the sales of traditionally delicious-but-not-very-good-for-you products like Coke have seen sales drop in the face of alternatives like energy drinks, exotic juices, and even plain ol’ water, the Big Mac mavens at McDonald’s have continually experimented with the mega-chain’s menu, its marketing, and its prices. In July, the franchise’s second quarterly report for the year was taken as a sign of good health, even if the food it sells remains the target of health-conscious critics. 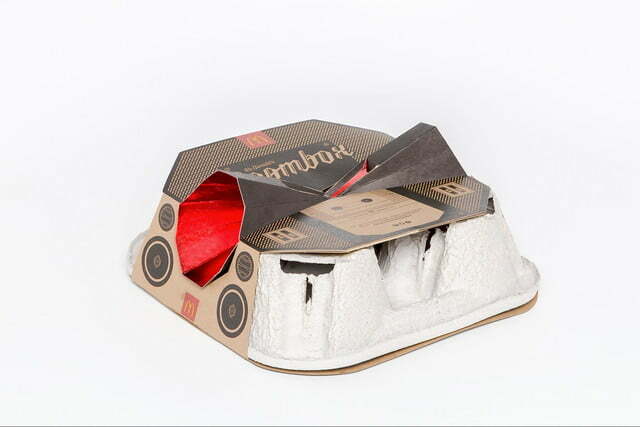 The latest example can be thoroughly explored via our McDonald’s Boombox review. 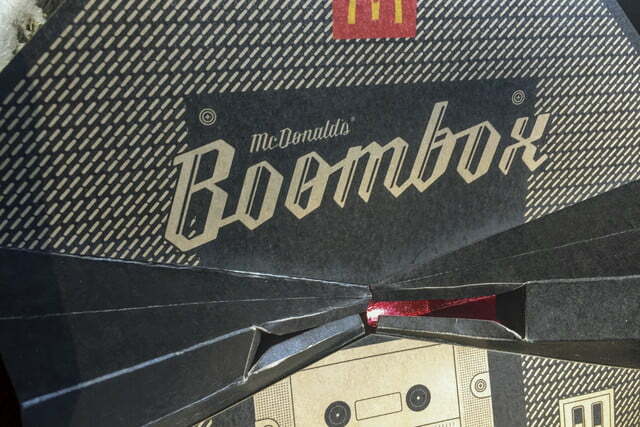 McDonald’s put some real money behind the design and engineering of the Boombox. 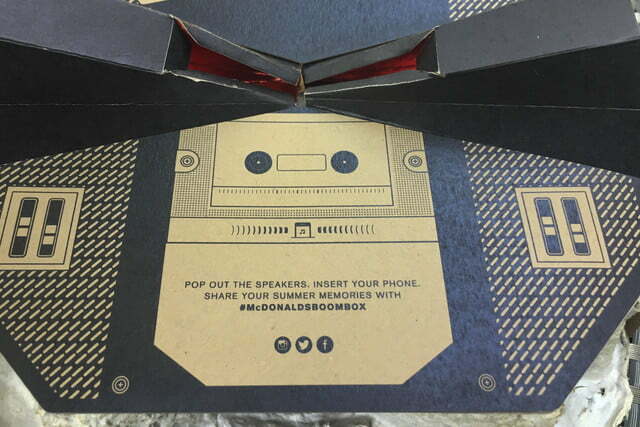 A prime example of how McDonald’s is trying to stay at the top of its customers’ lists when it comes to QSR – or Quick Service Restaurants, as the industry likes to think of itself — the McDonald’s Boombox is a regular cardboard drink tray imbued with audio powers thanks to a little bit of origami, and a lot of marketing. The Boombox made a surprise (and extremely limited) appearance at a single location in Toronto on July 28, where it was handed out to any customer who was in the vicinity of the city’s Woodbine Beach that afternoon. It was also accompanied by a free McFlurry, the restaurant’s popular ice-cream dessert. 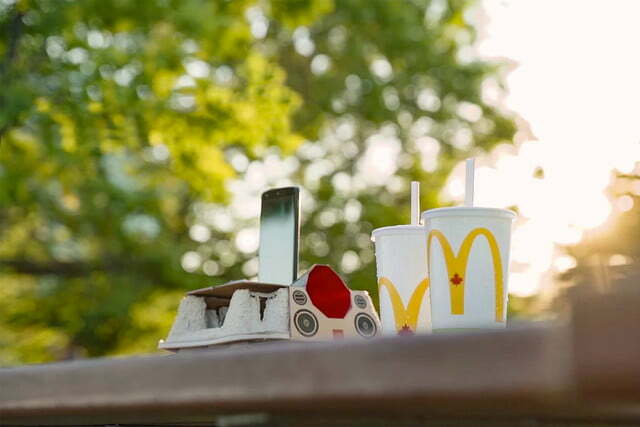 McDonald’s put some real money behind the design and engineering of the Boombox, enlisting the talents of both audio experts from the University of Waterloo’s Audio Research Group, and industrial design gurus at Stacklab. 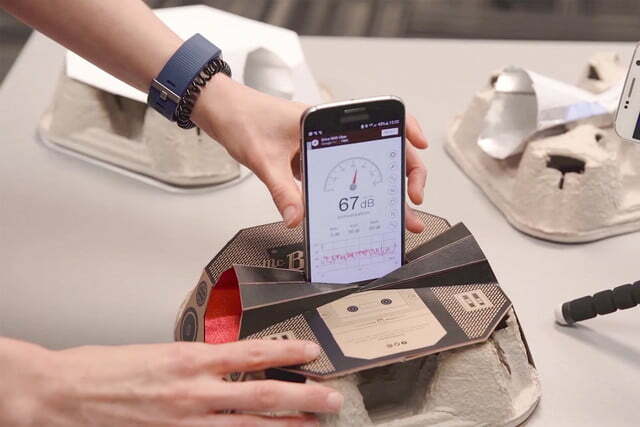 The result of their combined efforts is a drink tray that features two pop-up, double-cone polygon speakers, and a central slot that will hold pretty much any smartphone in portrait orientation. When Digital Trends received its review unit, we wasted no time in putting it to the test. Unfortunately – after trying with various phones including an iPhone 6, Pixel XL, ZTE Axon Mini, and even an aging Nexus 5 – we were (not surprisingly) less than impressed with the sound. While it’s true your phone will sound louder when sitting in the Boombox, a doubling of the volume was not what we heard. Moreover, even as the volume increased, actual sound quality felt significantly reduced. Low end bass, forever the weakest part of a smartphone’s audio profile, was sacrificed, while high-end frequencies sounded peakier. For our testing we auditioned some rap, jazz, hard rock, classic surf rock, and even a little classical music. With each phone and each genre, our crack panel of testers (i.e., family and friends) agreed: They sounded better without the help of the Boombox. That said, we feel we are now in a position to say that classic surf rock, like the Ventures’ Wipe Out, suffers the least from being amplified through foil-stamped cardboard speakers. 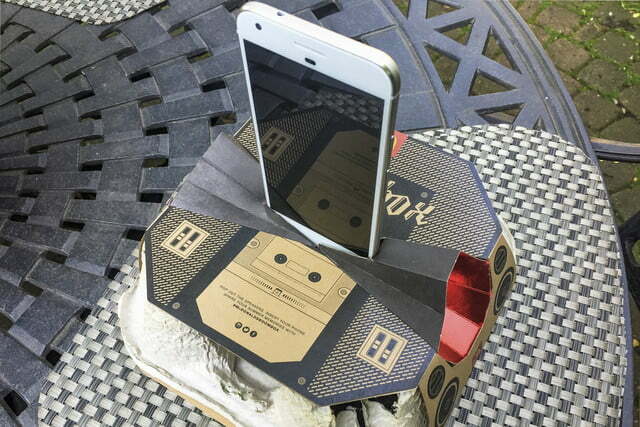 In fairness, we must acknowledge: We tested the Boombox outdoors. 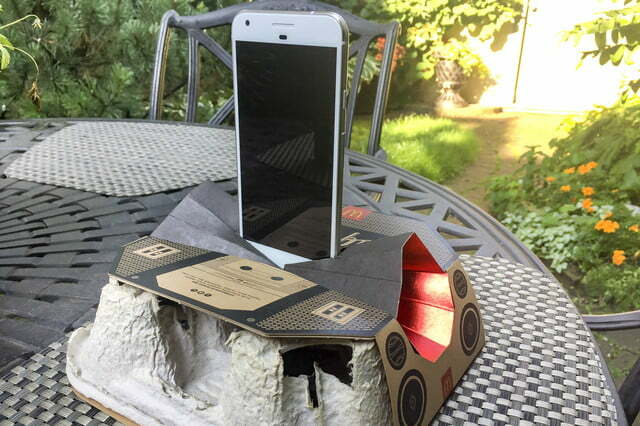 Yes, that’s hardly a lab quality environment, but we figured that if the Boombox was designed to let people share and enjoy their summer tunes, they would probably be doing so in a backyard, on a patio, or maybe on a beach … certainly not in an anechoic chamber. Also, all of the phones we had at our disposal had only a single speaker, with the exception of the Axon Mini, but its second speaker was on the other end of the phone’s body. Because of this, only one of the Boombox’s polygon speakers was active at any given time, which may explain why we didn’t hear the claimed volume increase. A phone like the iPhone 7, with its stereo, down-firing speakers, would probably have sounded better. We also listened to the Boombox head-on, because it seemed the only logical way to use it. 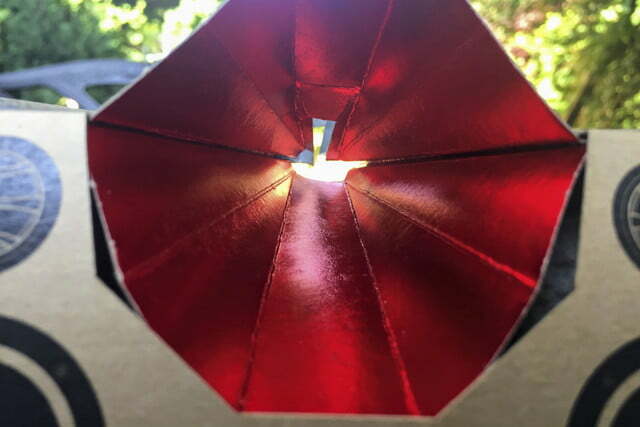 Turning the one active speaker toward us, made a big difference – increasing the volume considerably – but you really had to be in the direct line of fire in order to hear it, likely thanks to the speakers’ megaphone-like design. Are we disappointed that the Boombox didn’t deliver a better sound experience? Sure — well, a little anyway. 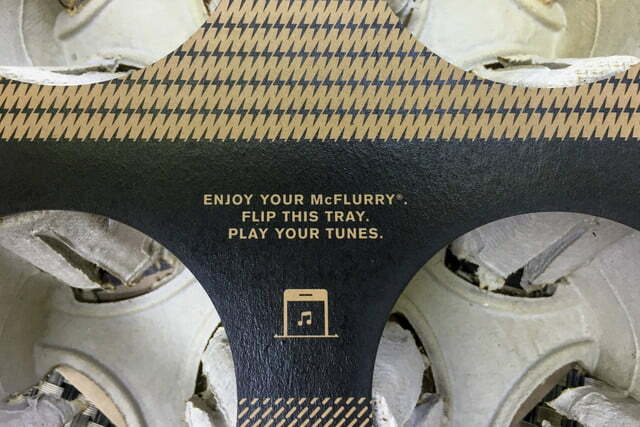 What makes us happy is that even if McDonald’s chooses to “go loud” and distribute the Boombox to a wider audience, at least it’s 100 percent recyclable, which is more than we can say for so many of the freebies the company has given away over the decades.